Mangalore Refinery and Petrochemicals Limited (MRPL) is a schedule ‘A’ Miniratna, Central Public Sector Enterprise (CPSE) under the Ministry of Petroleum & Natural Gas. 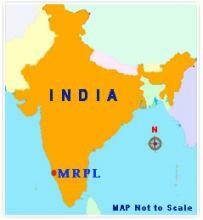 MRPL is located in a beautiful hilly terrain, north of Mangaluru city, in Dakshina Kannada District of Karnataka State (India). The 15 Million Metric Tonne Refinery has got a versatile design with complex secondary processing units and a high flexibility to process Crudes of various API, delivering a variety of quality products. MRPL, with its parent company Oil and Natural Gas Corporation Limited (ONGC), owns and operates ONGC Mangalore Petrochemicals Limited (OMPL), a petrochemical unit capable of producing 1 Million Tonnes of Para Xylene. OMPL, situated in the adjacent Mangalore Special Economic Zone ( MSEZ), is integrated with the refinery operations. Para Xylene from OMPL is sold in the export market. Shell MRPL Aviation Fuels and Services Limited (SMA) is a 50:50 joint venture between MRPL and Shell Gas B.V. (Shell), a step down subsidiary of Royal Dutch Shell Plc, Netherlands markets aviation turbine fuel (ATF) to airlines, both domestic as well as International carriers. SMA currently procures ATF from MRPL Refinery Complex, and supplies at Bengaluru, Goa, Mangalore, Hyderabad, Chennai, Calicut, Madurai. SMA also services International Carriers through alternative supply arrangement at Mumbai, Delhi and Kolkatta. MRPL has also maintained timely supplies to State Trading Corporation, Mauritius which has a long term supply contract with MRPL. The company has been continuously supplying fuel requirement to mauritius for the past dacade. Before acquisition by ONGC in March 2003, MRPL, was a joint venture Oil Refinery promoted by M/s Hindustan Petroleum Corporation Limited (HPCL), a public sector company and M/s IRIL & associates (AV Birla Group). MRPL was set up in 1988 with the initial processing capacity of 3.0 Million Metric tonnes per annum that was later expanded to the present capacity of 15 Million Metric tonnes per annum. The Refinery was conceived to maximise middle distillates, with capability to process light to heavy and sour to sweet Crudes with 24 to 46 API gravity. On 28th March 2003, ONGC acquired the total shareholding of A.V. Birla Group and further infused equity capital of Rs.600 crores thus making MRPL a majority held subsidiary of ONGC.